Here at the Cloisters, we have a large population of people from the Northern states as well as Italians. So when we do certain dishes, they are scrutinized closely and compared to "the way mom made it." I use my mom’s recipe—a recipe that has been passed down in my family and taught to my staff. So far, only a couple of people have mastered it. The secret to my mom’s lasagna is that she used cottage cheese instead of ricotta cheese. She blended it in a food processor and added eggs and Parmesan cheese to make the filling. Her meat sauce is special too—it has hot and sweet Italian sausage in addition to ground beef. My mom would make the lasagna on Saturday night and then put it in the oven when we got home from church on Sunday. It would come out of the oven bubbly hot and oozing with mozzarella cheese. I first introduced the recipe when I was sous chef here and it was a hit from the get-go, so we never deviated from the winning formula. 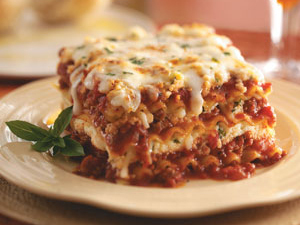 When we rotate lasagna into the menu cycle, we have to make about 12 hotel pans, or 420 servings, to meet the demand at our 300-unit senior living facility.